'Sequestered Sunshine' produces large bright canary yellow, single to semi-double blossoms. The blooms have a lovely fragrance. In the center of each blossom is a group of red-tipped carpels, showy yellow stamens and red flares. This plant has a bushy upright habit that does not require staking. It produces the largest clump of any of the intersectional peonies that we grow. Additional blooms are produced on side shoots to provide a longer bloom time. The long stems make this a nice choice for cut flowers. 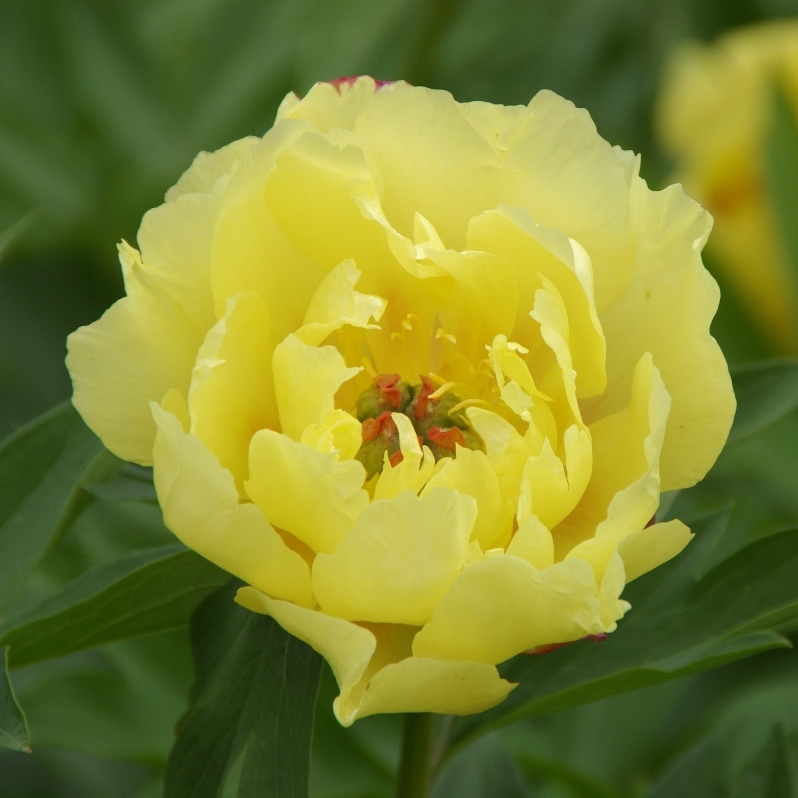 'Sequestered Sunshine' is an intersectional hybrid also known as an Itoh Peony. It should be planted with the eyes 3.5 to 5 cms below ground level. If the eyes have begun to grow they may stick up above the ground. All peonies are heavy feeders and grow best in rich, well drained soil that has been amended with compost. An annual top dressing of compost will help to keep them blooming well. A location in full sun to afternoon shade is ideal. Too much shade will make the plants lanky and bloom production will be affected. While the stems are woody this peony does die almost to the ground in the fall. When winters are mild buds may sprout part way up the stems so we recommend cutting the plants back in the spring after the new growth has started. Unlike tree peonies there is no graft so this plant can be divided after a few years although we recomend leaving the plant to increase into an impressive clump.